Pura Lempuyang is an ancient Hindu temple that sits on the highest peak of Mount Lempuyang. Pura Lempuyang Luhur is one of the most highly regarded temples in Bali, Indonesia. It is also known as ‘The Gateway To Heaven’ and in this blog post, it is easy to see why. Pura Lempuyang is located in the far east corner of Bali. 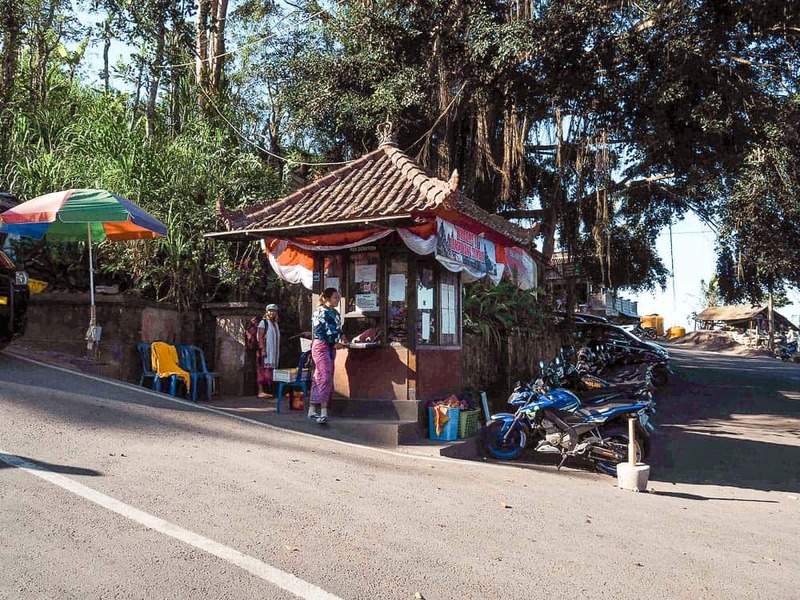 From Canggu, Pura Lempuyang Temple is a 2.5 hour drive and from Ubud, it takes around 2 hours. I would recommend spending a couple of days in the small coastal town of Amed when visiting Pura Lempuyang. From Amed to Pura Lempuyang Bali it is approximately a 30-minute drive. Click HERE to find accommodation in Amed and book in advance. The best way to get around the island of Bali is on a scooter. You can rent scooters in the main tourist hubs throughout Bali including Canggu, Seminyak, Kuta, Denpasar, Ubud, and Uluwatu. Scooter rental is 50,000 rupiah ($3.50) per day or you can rent them on a monthly basis from anywhere between 600,000 rupiah – 700,000 rupiah. ($40 – $50). 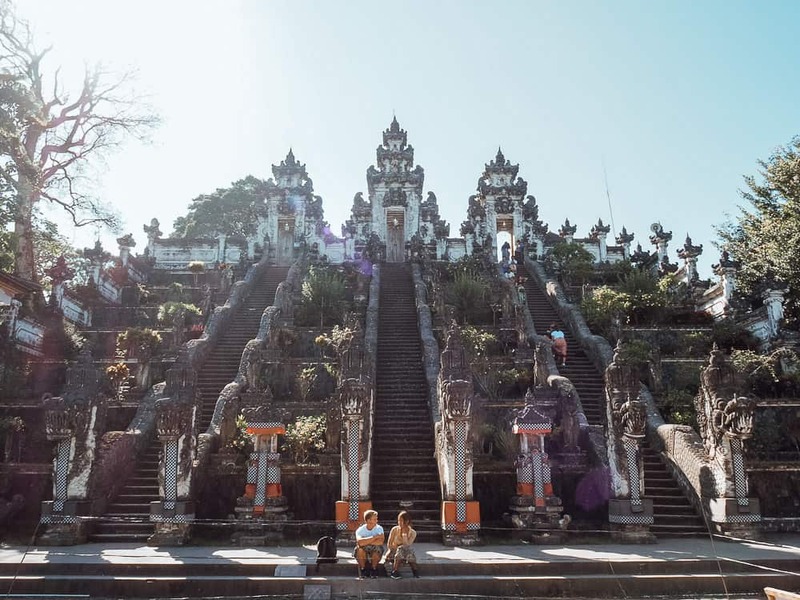 The entrance fee at Pura Lempuyang Bali is by donation only so you can choose how much you would like to pay to enter the Pura Lempuyang Temple. I paid 10,000 rupiah ($0.70) so something around that price is acceptable. A sarong is required to be worn around your legs and shoulders must be covered when visiting the ancient Pura Lempuyang Temple. If you don’t have a sarong to wear you can rent them for 10,000 rupiah at the ticket office before heading up the stairs to Pura Lempuyang. 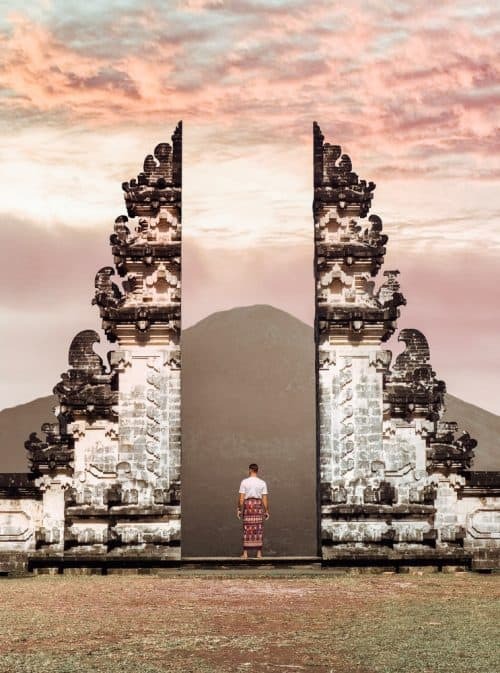 I have visited Pura Lempuyang twice now, the first time was at sunrise where I experienced an unforgettable sunrise that sprayed colours across the sky and Mount Agung sitting prominently in the backdrop. 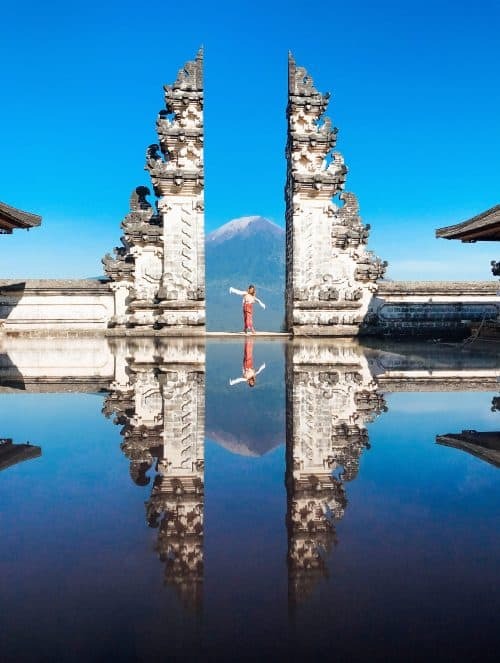 The famed ‘Gateway To Heaven’ is the most popular spot to take a photo and the traditional Balinese gate structure has gone viral on Instagram. As you reach the top of the stairs you will be greeted by a local man in the courtyard of Pura Lempuyang. He will softly splash some water on your forehead as a blessing before entering. 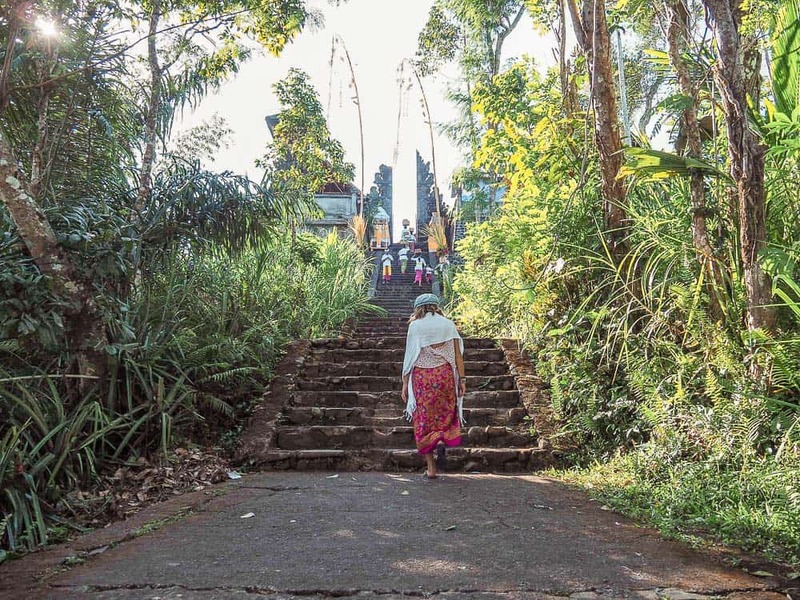 There are a number of temples on Mount Lempuyang, each of which is impressively hand carved stone and some with decorative fabrics wrapped around the carvings. 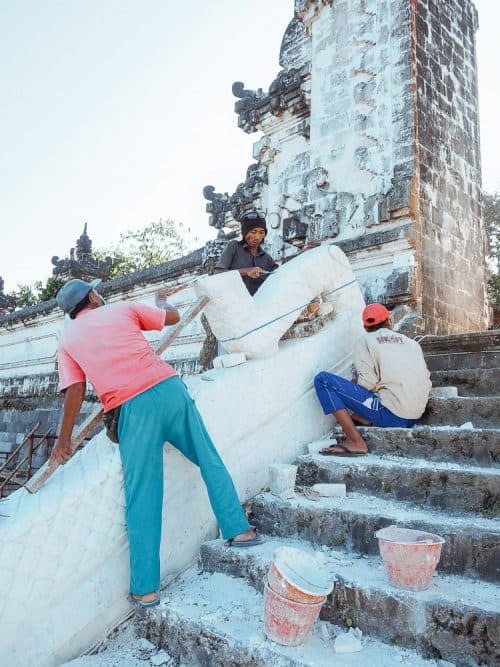 Recently, the local construction workers have begun some renovations and new carvings on Pura Lempuyang Temple though this didn’t affect my experience at this incredible location. It was actually really cool to see them hand carving the stone statues leading up to the gates at Pura Lempuyang Bali. 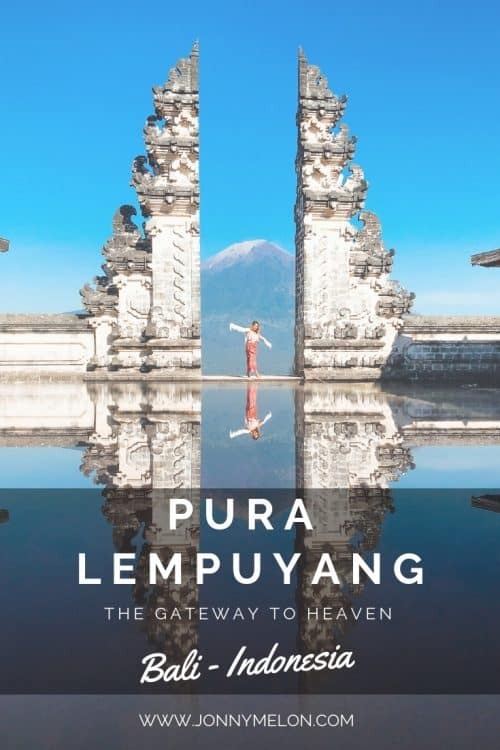 The best time to visit Pura Lempuyang is in the early morning before the crowds hit and also for sunset to capture the golden hour standing in the gateway to heaven! When you are out exploring in East Bali be sure to check out the blog posts below for some more epic adventures waiting to be had. 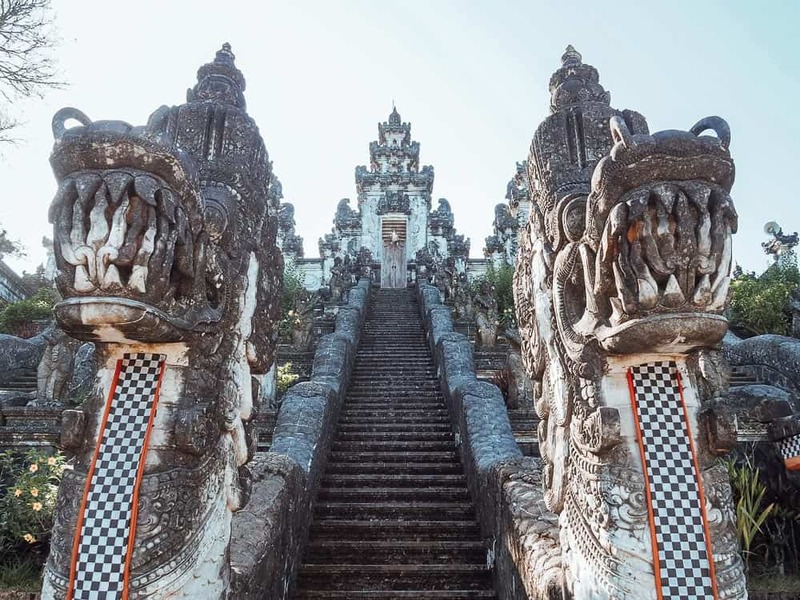 I hope you enjoyed reading this article and if you have any questions about Pura Lempuyang Temple please drop me a comment below. After reading the reviews I was a bit skeptical… but the ride from Ubud, the money ( you do pay for everything) and the wait in line (ours was less than 20 mins) were worth these amazing photos. Yes, there is a bit of camera trickery but you give your phone to the official temple photographer and he delivers amazing shots… and he helps keep the line moving. I almost didn’t go and I am so glad I did!! Hi can I ask what time did you all visit the temple for the shots? I am afraid if i reach before sunrise, there won’t be any photographer there to help me take the reflection shot. Hello, I went at sunrise and there were already locals there to take the reflection shot photos. Enjoy! Hello : What time interval is needed to take photo with reflection early April ?